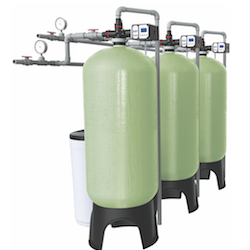 The 105 MTS Series softener is ideal for commercial customers who are looking for a reliable and efficient conditioning system with low initial investment and room to grow. The softener can provide up to 462 gpm of continuous soft water, 24 hours a day. The softener uses 40% to 50% less salt and regeneration water than conventional systems by bringing tanks online as flow rates increase and offline as flow rates decrease. It is able to operate for up to nine hours during a power outage, with no impact on the quality of water it produces. Engineered to prevent hardness channelling, the system is made of high-quality components, including Noryl control valves and corrosion-resistant fiberglass-reinforced polyethylene resin tanks that are NSF Standard 44 certified.